Today in Masonic History - Independence Day! 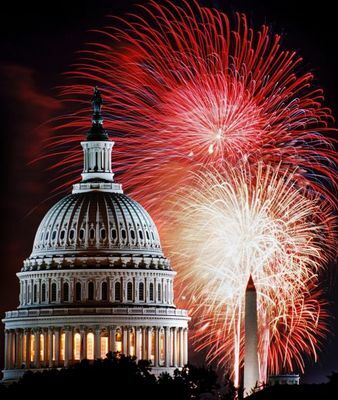 Today in Masonic History it is Independence Day, 2015. Independence day is celebrated annually in the United States to recognize the signing of the Declaration of Independence. The document was meant to explain the reasons why the 13 British colonies of the Americas chose to separate from England. Some scholars believe that the document was not signed until August 2nd, 1776. Although writings from Benjamin Franklin, Thomas Jefferson and John Hancock all say they signed the Declaration on July 4th, 1776. Independence day, in fact the American Revolution itself holds a special place for American Freemasons. We tend to hold up the fact that George Washington, Benjamin Franklin and various members of the Sons of Liberty were leaders in the Revolution. Although it is true that 9 Freemasons, out of 56, signed the Declaration of Independence, including it's most famous signer, John Hancock. It is not so much the men that made the impact on the Revolution. It is the principals of Freemasonry that helped to form the United States of America. Some scholars point to the publication, Anderson's Constitutions as a source for those ideals. Some of the ideals and codes of conduct which we find in Anderson's Constitutions would later appear in the United States Constitution. A common example is that Religion is not to be a topic of conversation in a lodge room where business is to be discussed. This was seen as an action that could cause a division within the lodge. Similarly, it can be equally said, that Religion in Government could cause that division in our ruling bodies, not allowing Government to properly govern for all of it's people. For the Declaration of Independence and the events that lead to it, those who know the lessons that our ritual inculcates it is obvious to see where the men who helped form the early United States believed in those principals, mason or not. As an example, Freemason's believe that we all meet upon the level, the Declaration of Independence states "We hold these truths to be self-evident, that all men are created equal". In the end Washington, Franklin, Hancock and the list of other notable and not so notable members of the American Revolution who were Freemasons, put themselves in harms way for their belief in a better future. It becomes less about those men and more about the ideals and principals, many of which are put forth by Freemasonry in the United States and around the World. Those same ideals are stated in our ritual over and over again, not to make them common place, but to remind us of the importance of those words that inspired revolutions, in the Untied States and beyond. As we celebrate the birth of the United States we should remember it was those Freemasons involved in the Revolution who had the courage to risk their lives for an ideal. It was in a Freemason lodge where they heard those ideals put forth and where they were reminded of them to the point that it became a part of their lives. That gift is now ours to cherish and pass on in our Freemason Lodges and in our communities. Happy Fourth of July everyone! May it be safe and filled with family and friends!